Players who dive in English football will face bans from next season under new Football Association regulations. Under the new rules, passed by the governing body at its annual general meeting on Thursday, a panel will review footage each Monday looking for cases of simulation. Any player unanimously found guilty of diving would be given a suspension. The FA also announced it has passed reforms it proposed in March, following criticism over the way it is run. How will the new bans work? 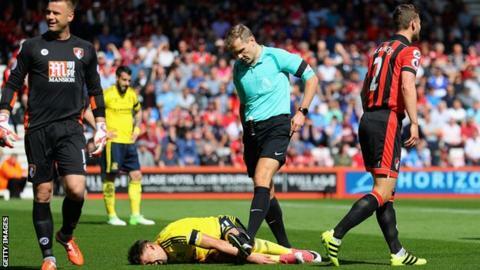 The FA defines the new offence for which players will be punished as "successful deception of a match official". Only incidents that result in a player winning a penalty or lead to an opponent being sent off - through either a direct red card or two yellow cards - will be punished. The FA says it will act "where there is clear and overwhelming evidence to suggest a match official has been deceived by an act of simulation, and as a direct result, the offending player's team has been awarded a penalty and/or an opposing player has been dismissed". Its panel will consist of one former match official, one ex-manager and one ex-player. The announcement follows what the FA said was "a period of consultation with stakeholders over the past few months". The rule change also required approval from the Premier League, the EFL and the Professional Footballers' Association. Speaking in December, Burnley manager Sean Dyche said he thought diving would be eradicated from football "in six months" if retrospective bans were introduced. Such bans have been utilised in Scottish football since 2011. The Scottish Football Association compliance officer - Tony McGlennan - reviews incidents in matches and determines whether or not notices of complaint should be raised. If a player is deemed to have dived during a game and the match officials did not recognise that at the time, the player will be issued with a disciplinary notice. The player can then either acknowledge guilt and accept the punishment offered by the compliance officer, or appeal. If it is the latter, a hearing is convened with an independent three-man panel - including people from legal and football backgrounds - who consider the case made by the compliance officer and the player before making a ruling. In December, five former FA bosses asked the government to intervene and change an organisation they described as being held back by "elderly white men". Sports Minister Tracey Crouch had said the FA could lose £30m-£40m of public funding if it did not modernise. Introduce term limits for FA Council membership. These were passed after a vote by shareholders at Thursday's annual general meeting, having already been approved by the FA Council in April. "I'm absolutely delighted the FA has understood the importance of good governance and implemented these reforms," Crouch said. The proposals were criticised for not going far enough when first announced in March. Lord Herman Ouseley, the chairman of anti-racism group Kick It Out, said he had "no confidence in the FA's proposals" and described the reforms as a "sham". He added certain minority groups would continue to be under-represented, and that "by prioritising women on boards, all other protected groups are being left behind". Given the FA's traditional resistance to change, this will come as a huge relief to many in the game, and be seen as a major victory for chairman Greg Clarke, who has succeeded where others before him had failed. It means the FA avoids the funding cut it had been threatened with by the government. Some critics believe the game's deficiencies are cultural - rather than structural - and these changes on their own will do little to address under-representation of minorities, inequality of wealth and power, standards of grassroots facilities and youth coaching, and a failing England team. But the hope will be that decision-making is improved, and that administrators - knowing they now only have a certain amount of time in post - are more likely to make a difference, and act in the interests of the whole of football.